Fr. John Whiteford's Commentary and Reflections: Stump the Priest: What does the inscription on my Cross say? Stump the Priest: What does the inscription on my Cross say? 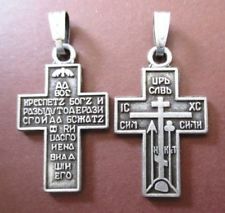 Question: "What does the inscription on the back of my Cross say?" 1. Probably the most common is "Спаси и сохрани" (Spasi i sokhrani), which means "Save and protect." 2. The next most common inscription is "Да воскреснет Бог, и разыдутся врази Его, и да бежат от лица Его ненавидящей Его..." (Da voskresnet Bog, i razidutsya brazi ego, i da bezhat ot litsa Ego nenavidyashchei Ego...). 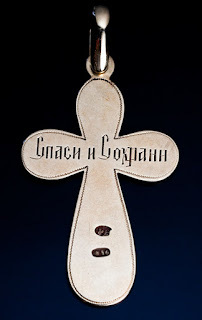 This is sometimes called an "Old Believer Cross", and the text is the pre-nikonian Slavonic text of the prayer said just before we go to bed, which is based on Psalm 67: "Let God arise and let His enemies be scattered, and let them that hate Him flee from before his face." The prayer in the prayer book goes on to say: "As smoke vanisheth, so let them vanish; as wax melteth before the fire, so let the demons perish at the presence of them that love God, and who sign themselves with the Sign of the Cross, and who say in gladness: Rejoice, O Cross of the Lord, for thou drivest away the demons by the power of our Lord Jesus Christ, Who was crucified on thee, Who descended into Hades and trampled on the power of the devil, and gave us His precious Cross for the driving away of all enemies. O most precious and life-giving Cross of the Lord, help me together with the most holy Lady Mother of God, and with all the holy heavenly powers, always, now and ever and unto the ages of ages. Amen" (Old Orthodox Prayer Book, trans. Priest Pimen Simon, Priest Theodore Jurewicz, Hieromonk German Ciuba (Erie, PA: Russian Orthodox Church of the Nativity of Christ (Old Rite), 1996), p. 45f).